Womanizer/Vamp pomade is a German brand, established 2013 by brewer Carsten Preußen (‘ß’ is pronounced as ‘s’). How did it all begin? What follows, is Carsten’s story: ‘In 2013, I got a pomade in my hands, whose fragrance just stole me from the stool. So I bought these, being ‘only’ a medium and not really suitable for my thin and very curly hair … but the scent! I started smearing my standard pomade and used the fragrant topper. Unfortunately, as this medium was so heavy on oil, it broke the grip of the other pomade and my hair was no longer able to do what I wanted. It was like crying, everything that smelled good, did not last me. Everything that looked good was not of my liking. It occurred to me that the producer of my standard pomade told me on his promotional tour that he initially cooked it on his farm himself. That’s when I told myself I could do it. I would create a pomade with the fragrance that suits me. I wrote down all the ingredients and started heating the cauldrons at home. If someone had told me at this time that I needed to study chemistry to brew this, I would have kept my fingers off it. After throwing away fat and wax for 1.5 years and repeatedly putting up with setbacks, a friend opened my eyes with just a phrase ‘remember the roots’. I changed the recipe a few more times and had the basic recipe that helped to tame my hair. I gave a sample for evaluation to a good friend with expertise. He was pleased that he rated the sample very constructively. So I knew that, except for some small flaws, I was well on the way. Since 2013, the pomade falls under the European Cosmetics Regulation. This meant for me that the pomade needed a so-called ‘safety assessment’ for which I then had a freelance reviewer. What did not belong, but was important for me, is a dermatological safety report, which I had created successfully … . It was important to me that no animals have to suffer for our vanity and therefore I have searched for an institute that only work with human subjects. No industrial goods for me. Since I enjoy the production and I would not let this take, I wanted to continue to produce the pomade from home, but which does not really conform to our laws at the domestic stove. So I got smart at the office and started building a space in our adjoining building where I could work under laboratory conditions. Thus, this pomade remains a home-brew, the first official and legal home-brew in Germany. Here the boss himself controls the quality of the ingredients, as well as that of the final product and does not leave it in the hands of large-scale industry. This also means that we as a small pomade company brew in small batches to offer the best quality and quality has its price. Carsten’s brand is split into 2 sections: Womanizer and Vamp. More info on the site. August 2018: a medium hold in several scents came to the table. The Womanizer pomade I review here, is a heavy hold beeswax based pomade. The brewer also calls it a wax. It comes in a 3.5 oz (100 g) tin with screw top lid. On the front, you’ll see the brand’s name and logo plus the pomade’s scent. You’ll also find the website and the type of hold. All the heavies come in the yellow/kaki color pattern. That’s all the info you get, but we know the drill, aren’t we? Wanna know more, check the website (in German). 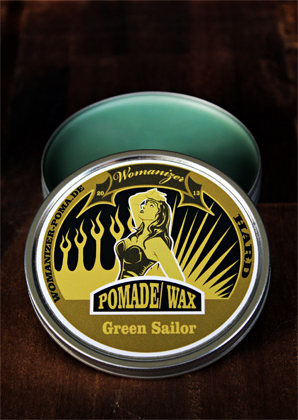 The pomade itself has a lime green color. Carsten send me this pomade, for free, to it try out! I’ll give an honest opinion. He also offered me this pomade in the rich boy scent. Thank you again, Carsten! My hair: medium thick, wavy, somewhat unruly hair of medium length. Wear a contour. Styling equipment: air motion (tangle-free) brush, Bixby comb and sometimes: a boar hair brush. Cera Alba, Petrolatum, Lanolin, Cocos Nucifera Oil, Cera Microcristallina, Parfum, Jojoba Esters, Cl 77288, Cl 77007, Citral, Cinnamal, Coumarin, Geraniol, Hydroxy-Methyl-Pentyl-Cyclohexene-Carboxaldehyde-2-(4-Tert-Butylbenzyl) Propionaldehyde, Linalool, Limone, 3-Methyl-4-(2,6,6-Trimetyl-2-Cyclohexene-Yl)-3-Buten-2-On. Cocos nucifera oil = coconut oil. Cera microcristallina = micro(crystalline) wax. Jojoba esters: a complex mixture produced from jojoba oil, hydrogenated jojoba oil (jojoba wax) or a mixture of the two. Cl 77288, Cl 77007: coloring agents. These difficult to read chemicals are there to make + fixate the fragrance for the most part. But, as already mentioned: this is a registered product with a dermatological safety report. Carsten offers different scents of which you can choose from on his website. I’ve the green sailor. Green sailor smells fresh, manly, a bit soapy, cologne alike. It smells strong in the tin. In the hair itself, it’s not that prominent anymore. You’ll catch breezes from time to time. This is not a pushy fragrance. Like it. Other scent I own: rich boy. Smells fresh, cologne alike, tart. Love it as well. Application: 3 licks, average size. Put these into damp hair as it tames my waves and facilitates application a lot. Scooping out: you need to push to get it out on the top layer. No fingernail needed. Beneath that top, it scoops out much easier. Breakdown: a few solid rubs between the palms and it becomes a waxy, creamy substance. It’s not really dry, not sticky and a bit greasy. No dealing with clumps of wax. Working in: you’re going to feel some slight tug. It is okay to distribute evenly. Combing back: there is a slight tension, but facile for a heavy hold. Switching the mop’s direction to the side + making your part: doable resistance. Control: once the pomade is in, it delivers good control. My hair followed the strokes of the brushes without being forced into a certain direction. Cowlicks behaved. No stray hairs popping out. Lifting my front area to make the contour went easy without letting the waves winning the game. It provided me with some nice, round, clean shape. There’s a great balance between slickness and hold for sure. Weight: around medium. You obtain decent volume/height with it. Styling time: average. This pomade styles comfortable for a heavy strength. Initial results: the bangs looked clean and neat. Results after 30 minutes: no sag, loose hairs, splits. Little touch ups. Womanizer heavy provides you with a nice shine. Level of shine is a few notches below medium which is good for a heavy. Its shine is not on par with f.e. Lockhart’s Goon grease, that one shines more but offers a tad less hold. The amount of shine remained the whole day. Heavy hold according to the brewer. For my hair it’s more a heavy on the lighter side. I like the hold, it delivers. This heavy endured very well, tested under following circumstances: 80° F, a good walk, little sweating, some sun and wind. Everything stayed together very well. No tug while restyling. Keeps its good hold with just a few waves showing up clean. For me, build up is: adding water and hair tonic and then a 2 licks of pomade. The build up feels rather clean, not too waxy, a tad greasy and is very manageable to work with the next days. 3-4 rounds of shampoo, typical for an oil based. My hair felt soft and healthy due to the nurturing components. Quixote, heavy hold oil based. Carsten made a well-balanced heavy hold! There’s a good slickness-hold-shine ratio. Despite being a heavier strength, it stays a comfortable pomade to style with! Good job!